Risk assessment algorithms—statistical formulas that predict the likelihood a person will commit crime in the future—are used across the country to help make life-altering decisions in the criminal process, including setting bail, determining sentences, selecting probation conditions, and deciding parole. Yet many of these instruments are “black-box” tools. The algorithms they use are secret, both to the sentencing authorities who rely on them and to the offender whose life is affected. The opaque nature of these tools raises numerous legal and ethical concerns. In this paper we argue that risk assessment algorithms obfuscate how certain factors, usually considered mitigating by sentencing authorities, can lead to higher risk scores and thus inappropriately inflate sentences. We illustrate this phenomenon through one of its most dramatic manifestations: The role of age in risk assessment algorithms. When considered as a factor at sentencing, youthfulness can be a double-edged sword—it can both enhance risk and diminish blameworthiness. If either risk or culpability is the sole issue at sentencing, this potential conflict is avoided. But when, as is often the case, both risk and culpability are considered relevant to the sentence, the aggravating effect of youth should presumably be offset or perhaps eliminated entirely by its mitigating impact. If judges and parole authorities are fully informed of the conflicting roles youth plays in a particular case, they can engage in this balancing act as appropriate. 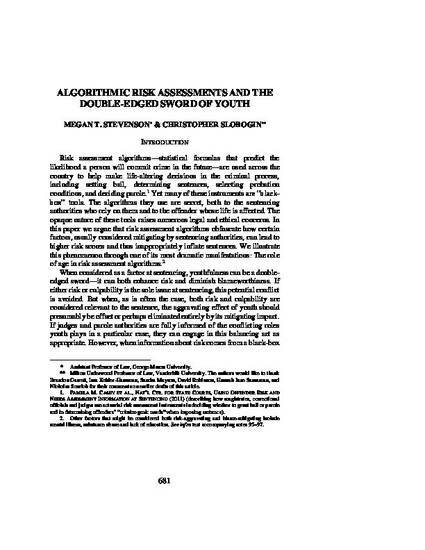 However, when information about risk comes from a black-box algorithm, they are unlikely to know the extent to which the risk evaluation is influenced by the defendant’s youthfulness. In such cases, their decisions about pretrial detention, sentence, or release may unknowingly give youth too much weight as an aggravator. Further, even if the black box is opened and the risk assessment algorithm is made publicly available, the risk score may not be conveyed in a fully transparent manner. For instance, while judges may be told that an offender’s youth is a risk factor, the relative weight of age in the overall score may not be fully explained or understood at the time of decision-making. Unless the judge makes specific inquiries, she will not be informed of the variables that contributed most heavily to a particular defendant’s risk score. This decisional blindness is especially pernicious in light of the impression created by the labels associated with these instruments—“high risk” or “high risk of violence.” Such labels not only convey information about the potential for recidivism. They are also suggestive of bad character, or at least a history of bad decision-making. In other words, these labels convey condemnation. Such condemnation might be appropriate for an individual who has earned the “high-risk” classification by committing multiple violent or ruthless acts. But it is not warranted for an individual who has earned that label largely because of his or her youth. To ensure sentencers take this double-edged sword problem into account, risk assessment algorithms should be transparent about the factors that most heavily influence the score. Only in that way can courts and legislators engage in an explicit discussion about whether, and to what extent, young age should be considered a mitigator or an aggravator in fashioning criminal punishment. In Part I, we discuss the tensions youthfulness generates in the post-conviction setting by introducing the double-edge sword phenomenon and the jurisprudence that has developed around it. In Part II, we present empirical evidence that shows how influential age is in the widely-used COMPAS Violent Recidivism Risk Score (VRRS) and in other common risk assessment tools. Specifically, we conduct a partial decomposition of the VRRS to show that age alone can explain almost 60% of its variation, substantially more than the contributions of criminal history, gender or race. Similar patterns are documented in other common risk scores. In Part III, we discuss how obfuscation of age’s impact on the risk score improperly undermines consideration of youthfulness as a mitigating factor. We also discuss how the points we make about the role of youth might apply to a number of other factors that are often used in structured risk assessments, including mental illness, substance abuse, and socio-economic factors. While our discussion centers on sentencing, the main argument is generally relevant to a broad range of settings in which risk assessments influence criminal justice outcomes.